"Chris is always ready to provide valuable insights and recommendations whenever I need them. His service, selection, and pricing remains top notch! Whether you are a beginner or an experienced collector, I can't imagine a better person & store to help you along the way!" “Sokolin has become my go to vendor for difficult to find wines at very attractive prices. I’ve also discovered some new wines that have become favorites. "I greatly appreciate the professionalism and prompt service that Sokolin Fine Wine Merchants delivers to all its customers, even a smaller one like myself. Kara was right on top of sorting through the logistics of my deliveries in a very timely manner." "I have had the pleasure of working with Sokolin and Chris for several years now utilizing their considerable expertise to build a cellar of classic first growth Bordeaux, hard to find Brunello, and cult California Cabernet. Their guidance and service have both been impeccable." “Sherri, thank you for your knowledgeable, personable, prompt, and excellent service." "I love Sokolin. In stock product. Vast selection. Fast service. Professional assistance. And the online store is fantastic with excellent filters, allowing you to very quickly drill down to specifics. Best experience I've found in stocking and growing my cellar. My go-to online store." "Sherri - Thank you - this is amazing customer service!" "The order arrived safe, sound and fast…Thank you for your outstanding friendly and professional service… I know when I get good service and I think more people should say how much they appreciate it. It seems these days people are quick to complain and forget to show gratitude! I will certainly be ordering from you again…"
"I had a great experience buying wines at Sokolin. The staff was very efficient and helped me in the hard task of choosing wines among the rich variety they provide. Certainly, I will come back soon and look forward to receiving new recommendations." "I appreciate your attentiveness and professionalism. I contacted a number of known wine merchants about the sale, and you stood out among the group." "It is very rare in life that you come across a company who is so dedicated to their customer service, in Sokolin I am delighted to say that I found such a retailer. Ordering wine from the UK to family in America was turning into a logistical nightmare however, from the minute Sherri got on the case I knew that my troubles were over. The service that I received was first class and the level of communication and reassurance surpasses anything that I have ever experienced. I thoroughly recommend Sokolin." "Good prices, great customer service and very fast shipping and delivery! I highly recommend Sokolin for your wine needs." "Our experience with Sokolin over the last 9 years has been nothing short of exceptional across the board. My husband always appreciates Daron's emails with wines available specific to our "wish list". The wines always arrive in perfect condition, and timely. On the flip side, we have also sold many wines to Sokolin. Josh has always provided accurate, professional, and seamless transactions. He has made each conversation feel as though it was the highest priority. The communication and customer service over the years has made our experience enjoyable each time. My husband and I are grateful customers, and look forward to always turning to Sokolin for the best wine solutions. It’s a great team of people who care. Thank you very much; it is always a pleasure doing business with you." “I have been storing wines at Sokolin for a couple of years now and have been very satisfied with the service. Matt always responds immediately to my requests by email or telephone and has never failed to come through on a commitment to make a delivery on a date certain." "Sokolin has a great selection of wines from all over the world. They have very knowledgeable staff, good delivery options and their website is one of the best I know. But what really distinguishes Sokolin is their customized service: George Stagani has been a great help to me in finding the wines I like at a very good price." "I've been working with Sokolin for over four years and the experience has been tremendous. In addition to providing an amazing selection, the prices are right, and the level of expertise is unmatched. The service team is great and my personal advisor, Jeff Gordley, goes out of his way to find me the types of wine I like. David Smydo has gotten on the phone with me himself when I'm looking for the right bottle of wine as a gift. I don't buy wine anywhere else." 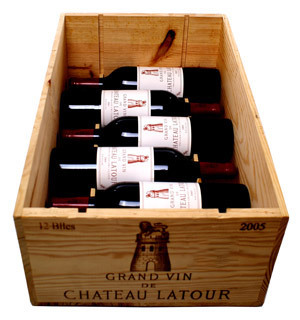 "The people at Liquid Asset Storage are wonderful to deal with and I can’t imagine storing my wine anywhere else. Matt Nowakowski and his team have done a great job keeping track of various deliveries and always keep me up to date on what’s been received. And it’s never a hassle to get a few bottles sent to my apartment or a case picked up, even on a moment’s notice. The convenience is great, but more than that, Sokolin runs a very professional organization, which is so important when it comes to trusting your wine collection is being taken care of." "I have purchased wines from Sokolin for many years. During this time, I have developed a close working relationship with Jeff Gordley. No matter what I have asked him to find, he has always been able to get what I have been looking for. It never ceases to amaze me that he is able to supply such rarities as Deus ex Machina, 2007 in case quantities! As you may remember, Robert Parker listed this wine as the one to drink if it was his last bottle to drink. If one is choosing one dealer to work with it is Sokolin and if one does, I don’t think you will need any other dealer." "Moving from wine drinker to novice wine investor can be an intimidating undertaking. George Stagani and the Sokolin team with their no-pressure, informative and educational approach have made this experience a pleasure. When you also consider Sokolin's buying power, I feel that I have found a valuable partner for my personal and investment wine purchases." "I have found Sokolin to be one of the most efficient and knowledgeable companies that I do business with in any arena period, let alone as a counterpart for wine futures and everyday wine purchases. Jeff Gordley in particular makes the wine buying experience one filled with deep knowledge of wine and its collectability as well as fantastic opinions on wines drinking well currently. The Sokolin experience is second to none!" "My scope of interest is extremely narrow.....Burgundy ..... This affords me the opportunity to know these wines extremely well. As a result I can speak with authority. Without question, Sokolin is the best source. Most of all, I have great confidence in the provenance of their selections. Equally important is the excellent range and value that they offer. Finally, while not a significant buyer in other areas....I feel confident that an exceptional job is done as well elsewhere. Over the years I have accumulated a great collection......thanks to Sokolin." "It was I who noticed the first catalogue from Sokolin which got my immediate attention. It was so classy and elegant. The catalog is arranged in a stylishly simple form with enough written explanation concerning a particular wine to be informative and interesting. We both pay attention to your Robert Parker and Wine Spectator ratings as well as wines that read "a favorite of the Sokolin Family or a wine the Sokolin Family had for Thanksgiving." There have been many wines we have received from you that we would have never thought of purchasing on our own. Many have become great favorites. Certainly Washington, DC has great wine stores and we are totally mobile people. Nevertheless, we keep coming back to Sokolin which has become our premiere source for excellent wine. Your staff is amazing…We have never had a problem with service… I prefer catalogues rather than going to the Internet. I enjoy sitting down at the table and perusing a catalog with a cup of tea (or perhaps a glass of wine) rather than sitting at a computer…Sokolin has brought so much pleasure to our knowledge and enjoyment of wine. We look forward to many more years of excellent Sokolin wines…"
"Sokolin offers an amazing experience with wine purchasing. Their quality selection is second to none (from back vintages to Bordeaux future offerings) and their customer service is exceptional. Sokolin's wine experts have been a valuable asset in my wine purchasing and really set them apart from other wine retailers. They are extremely knowledgeable and tailor their advice to your specific needs and tastes. Their advice and recommendations are very important in my wine purchasing. Whether I'm buying wine for enjoyment, entertaining or investment, Sokolin’s wine experts have been extremely helpful in that process. It's like having a personal sommelier!" "In the event that any future customer may wish a referral I hope you will feel free to cite me as a satisfied customer. Your conduct and that of your colleagues have been exemplary throughout all phases of negotiation and transaction. Please accept my personal thanks for your involvement in particular." "When one is buying fine wine, three things matter: (1) provenance and quality of the product; (2) access to the best producers; (3) customer service. After working with other national and international wine retailers, I now only deal with Sokolin. Every bottle of wine that I have ordered has been delivered in pristine condition, with attention to the smallest detail - whether it be original release paper wrapping or original wooden cases. Jonathan Muscatello is always available around the clock to help match customers with the best wine available at the most competitive price. Jonathan also possesses a terrific palate, and has introduced some of the most exciting wines I have ever tried. Sokolin and Jonathan are the one-stop for serious wine buyers." "Sokolin has made searching and shopping for those hard to find and highly sought after wines very easy. The timely email alerts, great prices and very responsive and friendly sales team -- Sokolin is hard to beat!" "Sokolin has consistently provided me with exceptional service, terrific pro-active suggestions and offers that are incredibly well-tailored to my preferred tastes in wine, rapid and responsive answers to my specific requests, great access to the wine auction market, and very competitive prices. I wouldn’t possibly consider working with any other dealer." "My wine arrived today - as always, the service from your staff, and follow thru have been top notch. Sokolin has never let me down, the selection is always varied and often has things that I cannot find in other venues. Keep up the good work!" "Sokolin has introduced me to the world of wine, both as a consumer and as an investor. Their guidance and attention to detail is extraordinary. I recommend their expertise across the board for all wines at all prices." "I've recommended Sokolin to numerous friends across the US. Price is just the starting point; selection and service (including shipping price and flexibility) make the difference." "I like getting Sokolin emails!! I find them informative and they put me in touch with some wines not locally available to me." "I really enjoy doing business with a company as reputable as yours. You always do a great job for me." "The team at Sokolin is the best. Their wine knowledge & customer service is exceptional. I have recommended you to several friends." "You are my sole source for any wine worth cellaring!!" "Just wanted to thank you again for all your help and wine recommendation. Several of our clients (who know wine) have complimented our gift purchase. I truly appreciate you not being a "sales agent", just trying to make a sale and the fact you made such great efforts to help me choose a nice bottle!" "Sokolin is the only place I order from at this point. They have everything I want, and can get anything I request, usually within days. After Jonathan's retraining of my palate, I find myself unable to drink wine at anyone else's house, unless they are an avid collector. He's shown me the real world of wine." "Thanks again for your great attention to detail and follow up. While I understand it is what you do, there are many service related people who don’t take the time to make notes, follow up etc! It makes a huge difference to me and I thank you for the great service." "Thank you for such superior customer service." "Thank you, Daron, you guys always do a great job." "Thanks for great customer service. You guys are in a class by yourselves."